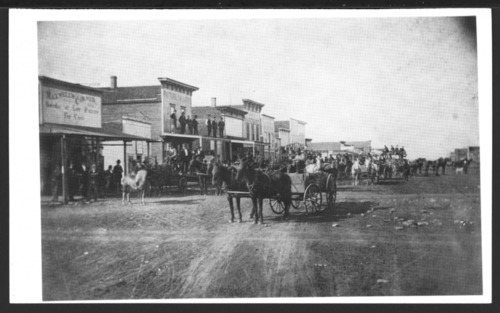 This black and white photograph shows the west side of Commercial Street in Oswego, Kansas. The store fronts with their wooden frames were destroyed by a fire in 1884 and later replaced by masonry buildings. In the foreground Jabez Zink and his team of horse are visible. He settled in 1865 on Labette Creek and eventually became the mayor of Oswego. There is also a stage coach that operated from Oswego to Independence and Coffeyville.